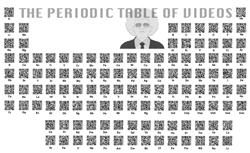 This is very cool implementation of QR codes made by The Periodic Table of Videos. They added QR codes next to every element in the periodic table and when you scan the QR code it leads to video where The Professor explains you about the element. Since the have All Rights Reserved on their Flickr image here is link to it where you can scan the QR codes and learn more about chemistry. This again proves that QR codes can be great for education purposes. Has anyone created a document to go with the videos that students can fill in? Very well! i have came to know about QR code. It’s very informative article, develop interest to know more about QR code. I am being a chemistry student like it.